Vinyl is the most common type of flooring, it’s been around for decades and it is still one of the most popular types of flooring. 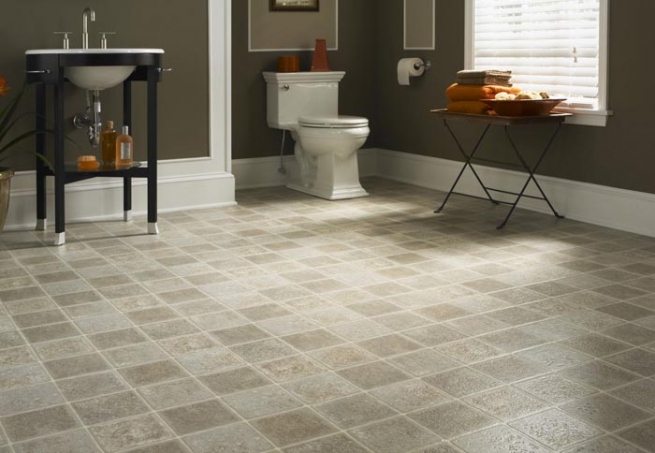 It’s easy to install, easy to clean and it comes in many types of products for your floors. Sheet vinyl is widely used in homes and commercial properties, is glued down, commonly has a felt backing and can be installed over almost any clean, dry surface. Commonly you will see sheet vinyl in kitchens, laundry rooms and bathrooms. It’s available in an array of colors and styles such as slate, stone, wood, and ceramic looks. The typical size of sheet vinyl is 6 ft wide or 12ft wide or other sizes depending on manufacturer. Vinyl is available at price points to fit any budget. Generally vinyl sheet flooring costs between $1.25 and $28.00 sq.ft. Costs can vary based on the overall thickness of the product and the thickness of the wear layer. Fiber Floors are relatively new to the flooring industry; this vinyl “fiberglass” flooring has become a fan favorite for its versatility, durability and comfort. Fiber Floors combine carefree maintenance and exceptional durability. Its construction is unique, combining a sheet vinyl with a fiberglass core that allows the flooring to lay flat, eliminating shrinking and expanding and curling with out having to use any glue. You will find Fiber Floors in a wide variety of colors and design options to match any décor. Like a traditional glue down sheet vinyl, Fiber Floors are easy to keep clean and easy to install. Fiber Floors have more cushion, are very comfortable and warm under foot. Fiber Floor costs are similar to what you will find in a mid to high range sheet vinyl. Vinyl also comes in Tiles and Planks to mimic the look of wood, tile or stone with the exceptional durability and performance of a vinyl. The installation can differ depending on the manufacture, most tile looks can be installed with or with out grout, and some of the wood planks can come with locking systems so they can float. At about the same cost of a high end laminate, LVT is a great alternative if you’re looking for water resistance and scratch protection. Vinyl Composition Tiles took the place of asbestos tiles, widely used in schools, hospitals, offices and public buildings up until the 1980s. VCT is used mostly in commercial and institutional applications, they are composed of colored vinyl chips formed into solid sheets then cut into 12” squares. VCT contains increasingly high percentages of recycled content and can withstand high traffic. VCT is also available with an antimicrobial protection that will guard your vinyl against bacteria growth. These tiles are typically waxed and buffed to maintain the surface.